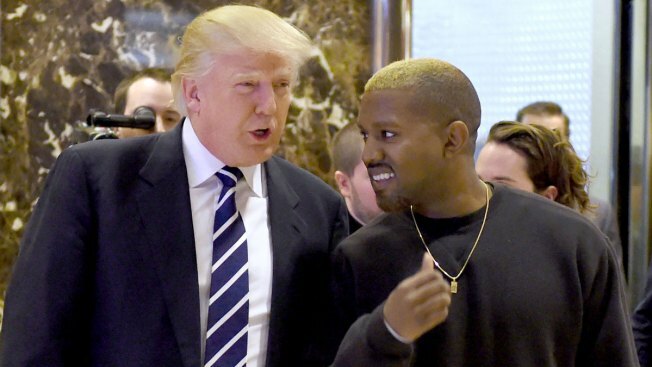 Singer Kanye West and then President-elect Donald Trump spoke with press after their meetings at Trump Tower on December 13, 2016 in New York. West professed his love for Trump on social media. For Kanye West it's all about love. And that love, he said on Twitter, extends to Donald Trump. Trump soon responded with a tweet of his own. West later clarified on Twitter that he doesn't "agree with everything Trump does." The public declaration of affection for the current commander in chief comes amid of flurry of erratic Twitter activity for the rapper. Earlier on Wednesday, he also announced he's cut ties with his manager Scooter Braun, saying bluntly "I can't be managed." yes I got rid of my last lawyer why? Because he wouldn't come to work full time. I also asked my last manager to come work full time for Yeezy of course the last lawyer and manager said no. So now I hired a CEO and a CFO and i have two full time lawyers as of now. Quoting sources close to to the rapper People magazine wrote West's increasingly erratic behavior was a cause for concern for some in his camp. In 2016, West was hospitalized for exhaustion after canceling his Saint Pablo tour. During the White House press briefing Wednesday White House Press Secretary Sarah Huckabee Sanders said she was not aware of any recent conversations between West and Trump. The pair met at Trump Tower during the presidential transition. Kim Kardashian West took to Twitter late Wednesday defending her husband against the backlash from supporting Trump.